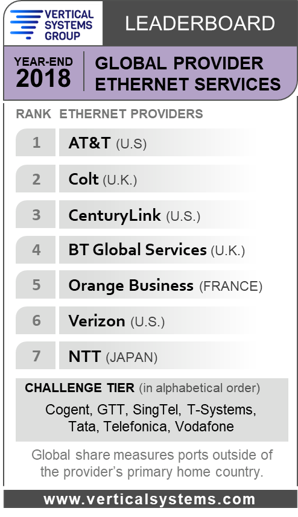 BOSTON, MA, March 13, 2019 – Vertical Systems Group’s 2018 Global Provider Ethernet LEADERBOARD results are as follows (in rank order based on retail port share): AT&T (U.S.), Colt (U.K.), CenturyLink (U.S.), BT Global Services (U.K.), Orange Business Services (France), Verizon (U.S.) and NTT (Japan). The industry benchmark for multinational Ethernet network market presence, the Global Provider LEADERBOARD ranks companies that hold a 4% or higher share of billable retail ports at sites outside of their respective home countries. Share margins continue to narrow among the leading global service providers in this very competitive market segment. Latest share results show a major shakeup in the rankings for the top five companies as compared to year-end 2017, with each in a new position on the 2018 Global Provider LEADERBOARD. “Multinational customers are massively upgrading bandwidth and expanding connectivity to cloud services and data centers. Ethernet providers with extensive global fiber footprints that deeply serve strategic business hubs are capturing a large portion of this new business,” said Rick Malone, principal of Vertical Systems Group. AT&T holds first position, which it initially attained by surpassing Orange Business at mid-2018. AT&T ranked second at the end of 2017. Colt ranks second, up from third position in 2017. CenturyLink is in third position. The company ranked fourth at year-end 2017 when it initially entered the top tier following its merger with Level 3. BT Global Services is fourth, as compared to fifth in 2017. Orange Business holds fifth position. The company previously held first position on every year-end Global Provider LEADERBOARD between 2009 and 2017. GTT is a new entrant to the Challenge Tier, advancing from the Market Player tier for the first time. The Challenge Tier of Global Providers includes companies with share between 2% and 4% of this defined market. Seven companies qualify for the year-end 2018 Challenge Tier (in alphabetical order): Cogent (U.S.), GTT (U.S.), SingTel (Singapore), T-Systems (Germany), Tata Communications (India), Telefonica Worldwide (Spain) and Vodafone (U.K.). The Market Player tier includes all Global Providers with port share below 2%. Companies in the year-end 2018 Market Player tier are as follows (in alphabetical order): Bell (Canada), Bezeq (Israel), CAT Telecom (Thailand), China Telecom (China), Chunghwa Telecom (Taiwan), Eir (Ireland), Embratel (Brazil), Epsilon (Singapore), euNetworks (U.K.), Exponential-e (U.K.), Global Cloud Xchange (India), Globe (Philippines), GlobeNet (Brazil), HGC Global (Hong Kong), Indosat Ooredoo (Indonesia), KDDI (Japan), Korea Telecom (Korea), KPN International (Netherlands), Masergy (U.S.), PCCW Global (Hong Kong), PLDT Global (Philippines), Rogers (Canada), Spark (New Zealand), Sparkle (Italy), Sprint (U.S.), StarHub (Singapore), Telekom Malaysia Global (Malaysia), Telia (Sweden), Telin (Singapore), Telkom South Africa (South Africa), TelMex (Mexico), Telstra (Australia), UPC Business (Switzerland), Virgin Media (U.K.), Zayo (U.S.) and other providers selling Ethernet services outside their home country. Detailed Ethernet share results that power the Year-End 2018 Global Provider Ethernet LEADERBOARD are available now exclusively through Vertical Systems Group’s ENS Research Program subscribers of @Ethernet. Contact us for subscription information and pricing.